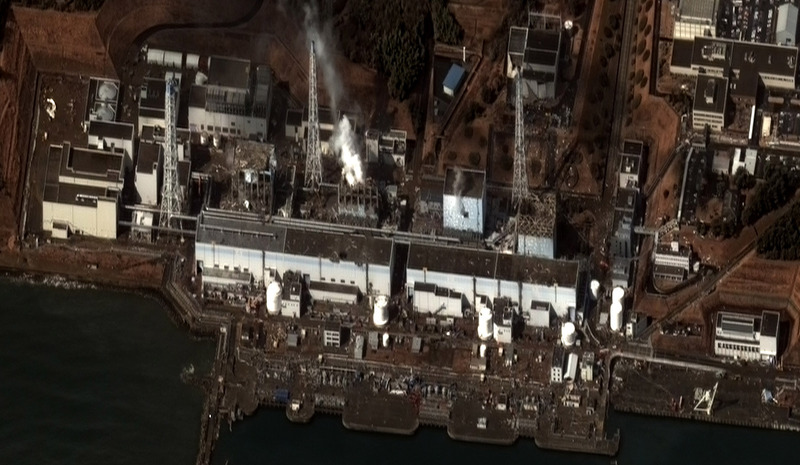 Yesterday we posted on the deepening crisis at the blast-damaged Fukushima Daiichi power plant in Japan; our first version of that post compared a March 16 high-resolution satellite image of the plant with what we thought was a March 12 image of the same plant. A couple of alert readers pointed out that the March 12 image actually showed a sister nuke plant nearby, the Fukushima Daini plant, so we removed that image from the blog (you can see it here). The situation is steadily getting worse at the Fukushima Daiichi nuclear power plant crippled by Japan’s earthquake and tsunami. These hi-resolution satellite images from DigitalGlobe starkly reveal the extent of damage to the outer containment buildings surrounding the reactors. 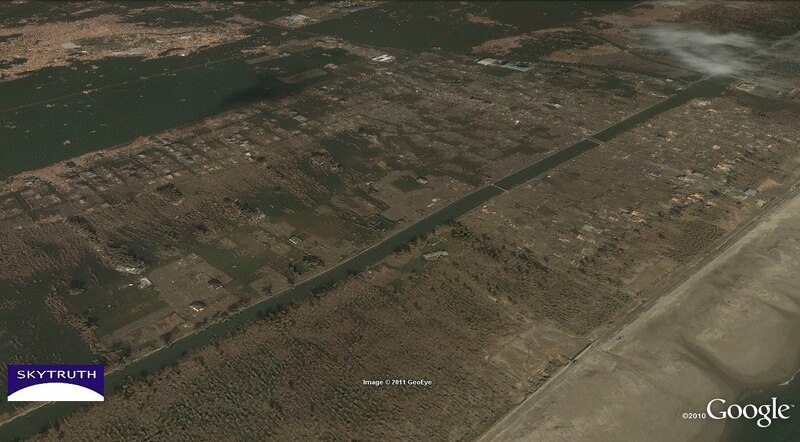 Check out all of the images and damage analyses at the DigitalGlobe website. BOEMRE, the Federal agency managing offshore energy development, just issued a second permit to allow deepwater drilling to continue in the Gulf of Mexico. Like Noble Energy, recipient of the first permit, BHP Billiton (an Australian company) will resume drilling on a well that had been partly completed when the BP / Deepwater Horizon explosion and massive oil spill occurred last April. Another unfortunate similarity: the public version of BHP’s permit application contains no information about oil spill containment, cleanup, or other response plans and capabilities. I hope it’s all in the redacted version. But shouldn’t that information be readily available to the public, along with a record of decision detailing the agency’s review of the information and justifying their confidence that the applicants can respond rapidly and effectively in the event of a major incident and spill? Maybe somebody from BOEMRE can explain that to us. Otherwise, we’re just skipping down the road to the next disaster. 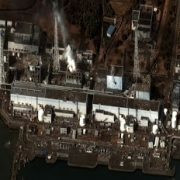 Lots of satellite images of this disaster, including very high-resolution images from Geoeye and DigitalGlobe, are now becoming publicly available, showing from above the destructive power of the brutal one-two punch Japan has endured. Here’s a panoramic before/after view of what used to be the pretty little coastal neighborhood of Arahama in the city of Sendai, 80 miles due west from the quake’s epicenter and in the immediate path of the nearly 30-foot-high tsunami that swept the coast. 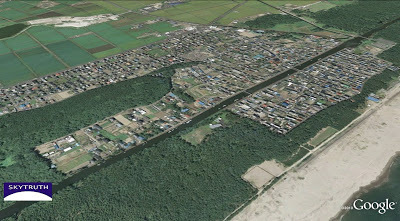 The ocean is at lower right. 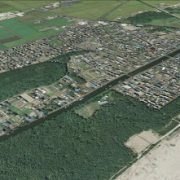 Many more before/after high-resolution satellite images can be seen by Google Earth users if you download this KML file from Google’s information-packed 2011 Japanese Earthquake and Tsunami Crisis Response website. The KML includes low-resolution MODIS and radar images too, and reports from folks on the ground that are being collected using Ushahidi, the same tool we’ve deployed to track impacts in the Gulf during the BP oil spill. ABC News (Australia) has a similar interactive collection with an even easier slider feature. 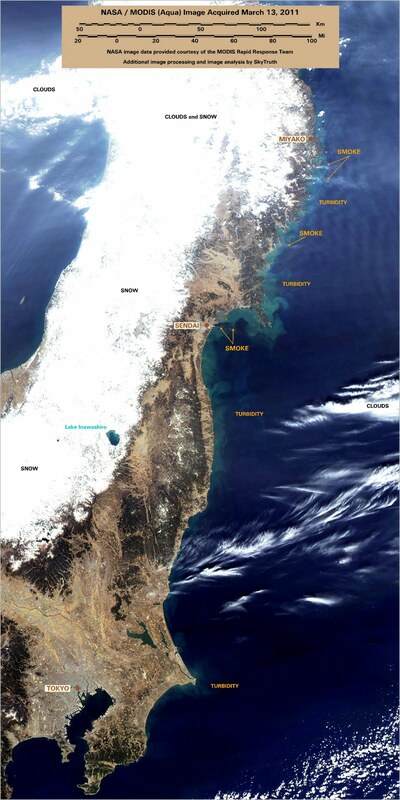 And NASA has a page featuring their low-resolution daily MODIS images, which we’ve found useful for illustrating smoke plumes and ocean turbidity. Let us know if you find more useful images. Natural disasters aren’t our main focus here at SkyTruth, but if we can see a way to help when they occur we’ll do what we can. 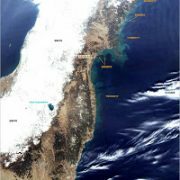 Clear skies follow tragedy: this MODIS / Aqua satellite image to the left was taken on March 13, 2011 at about 12:55 pm local time in Japan. Click on it to see a larger version. Striking bright aqua and turquoise patterns in the water reveal turbidity along much of the Pacific coast of northeastern Japan. This turbidity is probably sand, churned up off the seafloor and scoured from beaches by the massive magnitude 8.9 earthquake and series of destructuive tsunmami waves that it generated; and mud and debris washed off lowlying coastal areas that were inundated by the tsunami. Several plumes of smoke are visible as well, blowing eastward off the coast and out to sea. Three faint white plumes are visible between Miyako and Sendai. 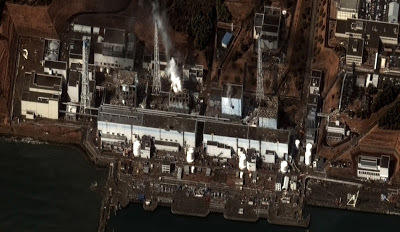 A fourth plume, dark brown, continues to emanate from the city of Sendai and may be caused in part by a fire at a major petrochemical facility. Radiation leaks from crippled nuclear reactors along the coast are a serious concern at this time. 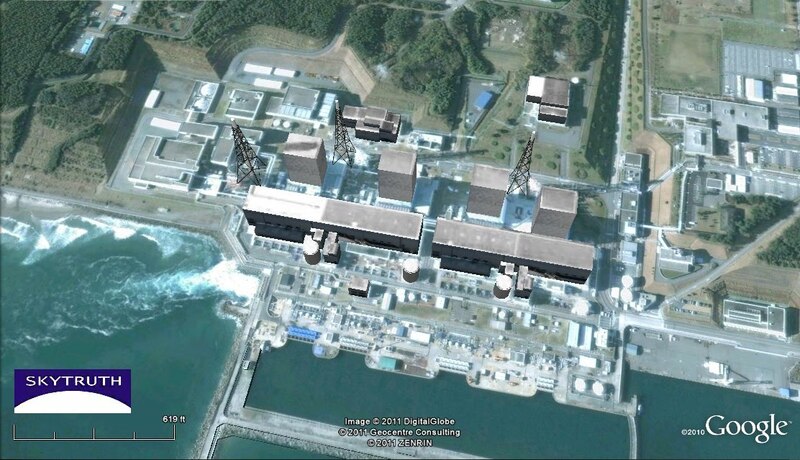 If prevailing winds continue to blow from the west, releases of radioactive gases into the air should move offshore.